Tired of the same old filtered images and videos? Instagram has a new app to spice up your main feed. Your Instagram feed is about to be hit with a new kind of image—something caught between a looping Vine and a GIF that lasts just one second. This video-photo hybrid is the product of Boomerang (App Store or Google Play), the latest stand-alone app from Instagram. Boomerang is best for funny action shots. There are now tons of apps designed to help you create GIFs out of videos, but Boomerang takes a different approach. The new app captures a burst of photos and stitches them together for you. The end result is a video that loops forward, then reverses in an unexpected twist. Capture a burst of a sprinting puppy, and Boomerang will turn it into a video of the dog running back and forth forever. Like Vines, Boomerangs loop endlessly. The app doesn’t require an Instagram account to use, though presumably you’ll want to share the finished video to your feed (or to Facebook). Boomerang will save the end result to your Camera Roll. Why this matters: Instagram has 400 million monthly active users who adore the service and use it to share 80 million photos a day. But the platform has worked hard under parent company Facebook to constantly improve its features—both in the main app, and with stand-alone experiments like Boomerang. Instagram’s other stand-alone apps, Hyperlapse and Layout, are more useful for the average Instagrammer than Boomerang is, though they’re all pretty basic. With Boomerang, you can toggle between your camera’s rear-facing and front-facing cameras by swiping the screen, but that’s as complicated as the app gets. But Hyperlapse and Layout offer essential tools. Hyperlapse adds extra video-editing capabilities for speeding up or slowing down your footage before importing it to the main Instagram app for filtering and sharing to your feed. 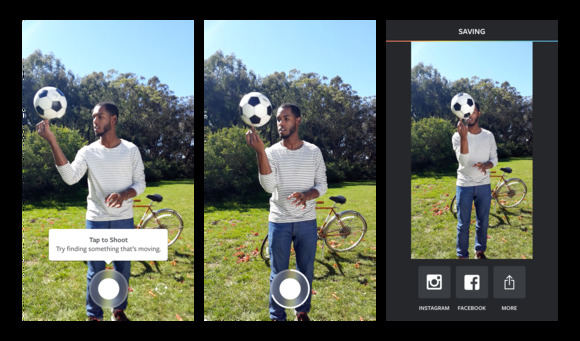 Layout creates Instagram-ready collages, which people love when they want to share a few photos at once. Boomerang is a little different—the app is more of a fun diversion than a must-have. But, like with Vine’s six-second video loops, the creative possibilities for Boomerang are endless. We expect to see Instagram’s already insanely creative community to experiment with the app in unusual ways.